We had some leftover pulled pork from last week's pulled pork nachos. I used it to make a delicious frittata (essentially a crustless quiche) by combining the smoky flavor with leeks from my garden and some rich Gruyère cheese. Delicious! 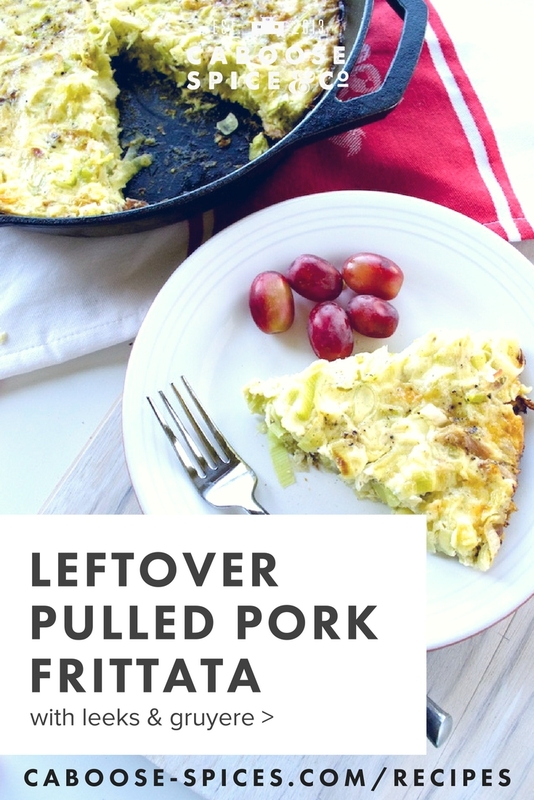 Recipe for leftover pulled pork: Pork, Leek & Gruyere Frittata — yum! Leftover pulled pork is not normally an issue in our house. However, after Gloria's pulled pork nacho party last week, we were lucky enough to have a little leftover pulled pork. Now that we have a Traeger grill, I love smoking 2 or 3 pork shoulders at a time. There's so much room that you may as well use it — you'll use the same amount of pellets either way. Pulled pork is easy to freeze too — if you have some in the freezer, you can grab it for this delicious pulled pork frittata recipe. I adore bacon & leek quiche. The best-ever recipe for bacon leek quiche is by Grace Parisi & can be found on Food & Wine's website. It uses heavy cream and is literally a slice of heaven. Since I'm trying to stay healthy, I've omitted the crust and swapped the bacon for pulled pork to use up our leftovers. I've also used a combination of milk & sour cream instead of heavy cream. It's just as delicious too. Cut leeks in half lengthwise, and slice into 1/8 inch thick pieces. Melt butter in cast iron pan over medium heat. Add leeks to pan, seasoning with Abilene Depot. Cook until leeks are soft, about 3-5 minutes. Add thyme leaves. Cook for 1 minute more. Set leeks aside in a bowl. Stir in pulled pork and cheese. Clean cast iron pan and grease with coconut oil or olive oil. Whisk milk, sour cream, eggs, and egg yolks together until frothy and smooth. Season with Abilene Depot. Add leek mixture to cast iron pan. Pour egg mixture in pan, mixing with leek mixture so ingredients are evenly incorporated. Bake in oven for 35 minutes, or until golden brown and firm to the touch. Enjoy! If you don't have any leftover pulled pork on hand, you can use 6 ounces of thick cut bacon, cut crosswise into 1/2-inch wide pieces. Fry the bacon first, then set aside. Drain all but 1-2 tablespoons of bacon fat, and sauté the leeks in the bacon fat instead of the butter. Follow the rest of the steps listed above for a bacon-leek crustless quiche.